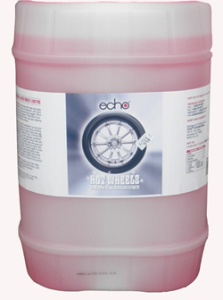 Echo Hot Wheels is a biodegradable, multi-purpose acid cleaner formulated to clean aluminum and wire wheels. It will also brighten wheel covers. The non-flammable, water soluble properties make it an outstanding cleaner for removing brake dust, grease, and road grime. It complies with CARB / OTC VOC restrictions. Note: The product can be used on chrome and steel, but do NOT let the product sit on the surface. Scrub and rinse thoroughly. 1. Apply Echo Hot Wheels with a brush or spray bottle, onto a cool, wet surface. 4. Use a nylon cleaning pad on wheels, where surface is badly pitted. 5. For painted or coated wheels, test in an area that will not show to ensure compatibility with the paint or coating before washing the whole wheel. 6. Do not allow the product to dry before a thorough rinsing.